The museum has a good collection of old photographs including ships and their captains, Nefyn town and its people, fishermen and their boats and nets, groups such as football teams, school photos, a carnival or two and Pothdinllaen lifeboats and their crews. 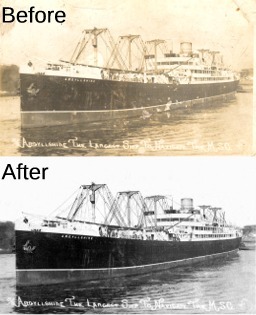 Many of these photographs are in poor condition, having deteriorated in the damp atmosphere of the old museum after it closed, but we are in the process of copying them to computer where marks and scratches can be ‘cleaned’ in order to present clearer images while at the same time retaining the integrity of the images. Digitising the photographs also preserves them for present and future use. To add to our collection, we are delighted to borrow photographs where donations are not possible. These are immediately copied to computer and returned to the owner. Some of our results have been displayed at our coffee mornings together with information we are gathering about family histories and past residents of Nefyn and Morfa Nefyn. We hope to expand these histories to include more of the Llŷn peninsula. Other images we are collecting are those of ships’ censuses from 1861 to 1901 and the all important certificates issued to Mates and Master Mariners.